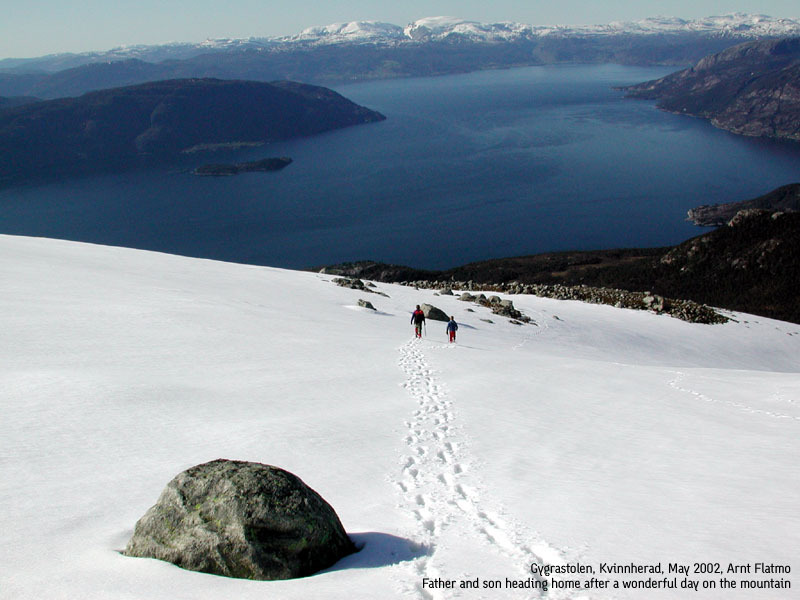 How to get there: This mountain is located in Kvinnherad, a small community east of the Hardangerfjord. 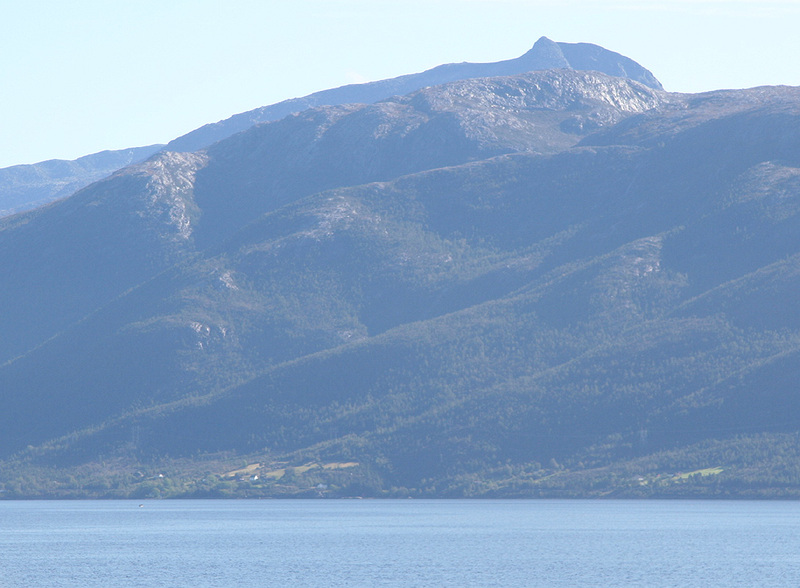 This area has some of the most alpine peaks in Hordaland, between the fjord and the glacier Folgefonna. From Bergen, one can drive in about 1.5 hours to Gjermundshamn where a ferry crosses to Årsnes (previously Løfallstrand) in Kvinnherad. Continue north for 12.3 km to the small community Ænes, sharp right turn up a hill. Drive straight ahead on this small road until you find a small white church. Park there. 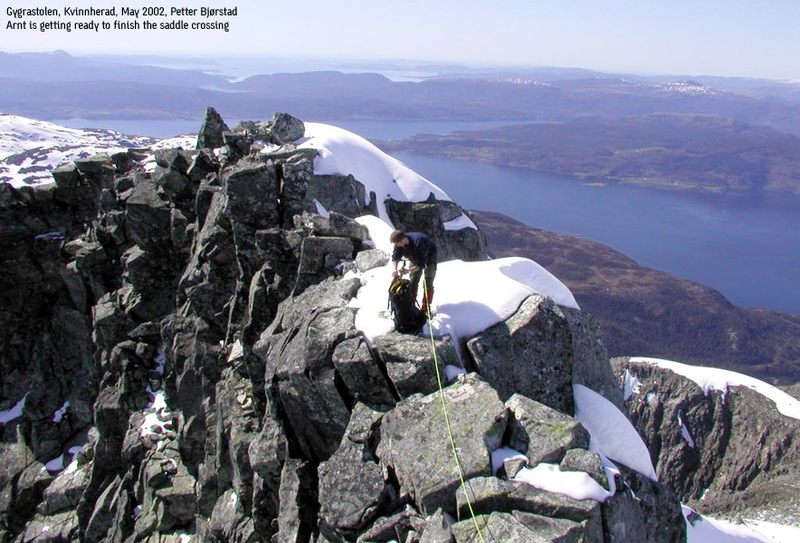 Route description: The map has a single trail indicated leading to Gygrastølsvatnet, however, there is a better way. As you hike from the church, you will see a nice rack with mail boxes (see also picture below). Take the dirt road that heads out just on the left side of this rack. Follow this small road to its end where it gradually transforms into a trail that heads uphill. This trail will run into another primitive road higher up and just left of a small river. Turn right on this road and cross the river and find a red (ring) marked trail that goes left just a few meters after the river. This route takes you west of Svartaberget, it is not marked on the map, but clearly the best and most direct way. Follow this trail further upwards, in the beginning on the right side of a small creek, then up and eventually leaving the forest behind. You should continue uphill aiming for the ridge on the right hand side of the basin that extends up towards the summit. The ridge climbs gently to the point Skrunten (1046m) on the right hand side. From this point, the slope gets steeper and an iceax and crampons may be needed in the spring. The snow is of moderate steepness, about 30 degrees with a couple of shorter sections near 45 degrees. 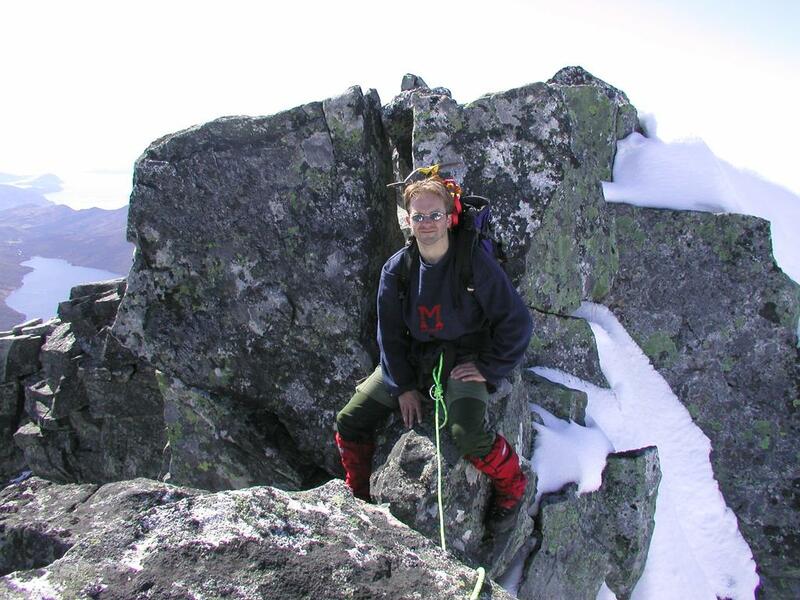 The climb tops out at about 1300 m and reveals a narrow ridge before the final summit. This ridge is class 4 with considerable exposure. There are basically two moves, the first is a vertical drop off a cliff, the flat ridge which has been at least a couple of meters wide until this point is only about 30 cm wide at the bottom of this drop. The vertical drop is about 1.5 meters and as you lower yourself down you know that you end up at an extremely narrow rock with near vertical drop on both sides. The exposure on the climbers right is a very steep rock face while the left side is a steep snow slope. There is a narrow crack that may be helpful, in particular for smaller people and kids, slightly to the right, we all made use of this crack when climbing in the opposite direction on return. This passage is technically simple, but could scare people that are not comfortable with heights. The ridge quickly becomes more reasonable, the narrow section is only a couple of meters. The second class 4 (YDS rating) move is getting off the ridge and onto the final summit ridge. Climb left and up on good rocks, while checking for a few loose ones. After this move, the climber can stroll onto a very nice summit. There is an alternative approach from the east, this involves downclimbing into a saddle in the form of a fairly distinct ridge, however both the down climb as well as the climb back up towards the summit are more on a slope than on a ridge. This route may be a bit more difficult, depending on the season, when we were there the route had steep snow, exposure and limited opportunity for good belays. 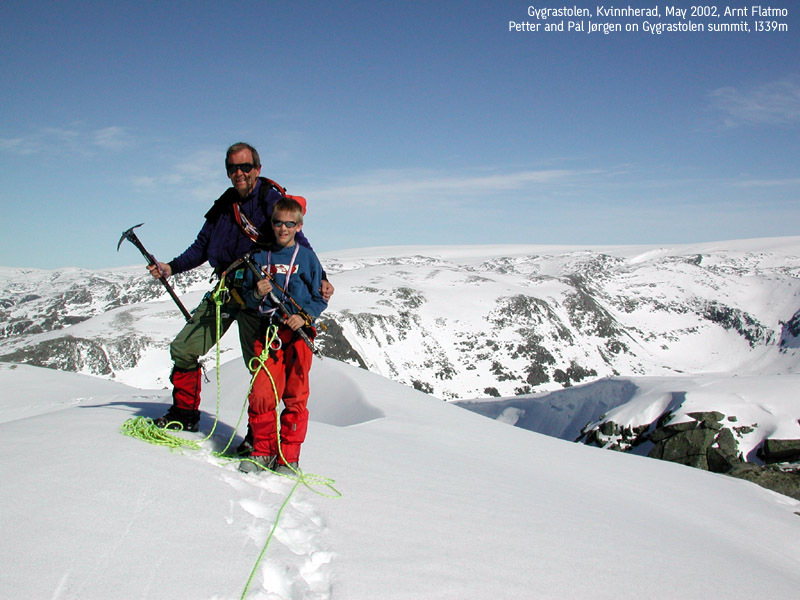 Comments: I did this climb with my son Pål Jørgen, age 13, and my friend Arnt. 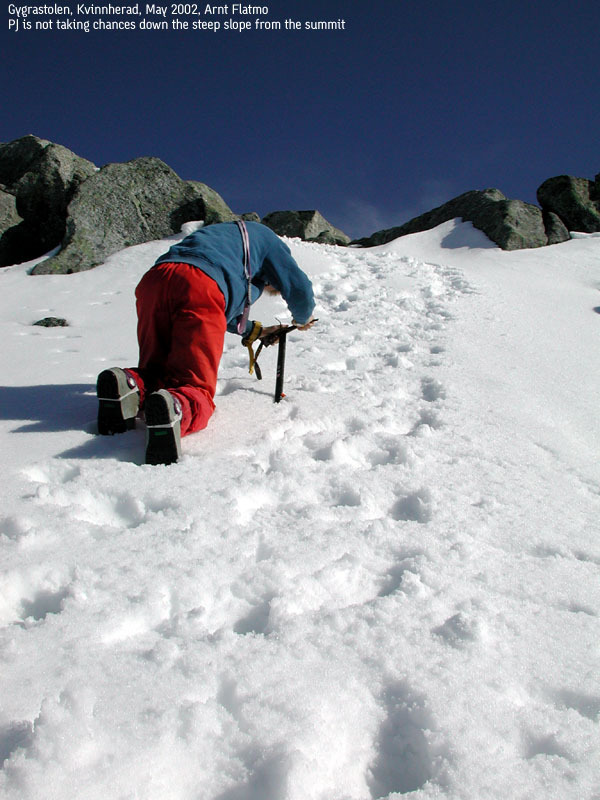 We saw no tracks or traces of other climbers, perhaps this was the first ascent in 2002. It is safe to assume that the true summit is climbed relatively seldom. We started at 1115, the weather was just fantastic, warm, blue sky, no wind. 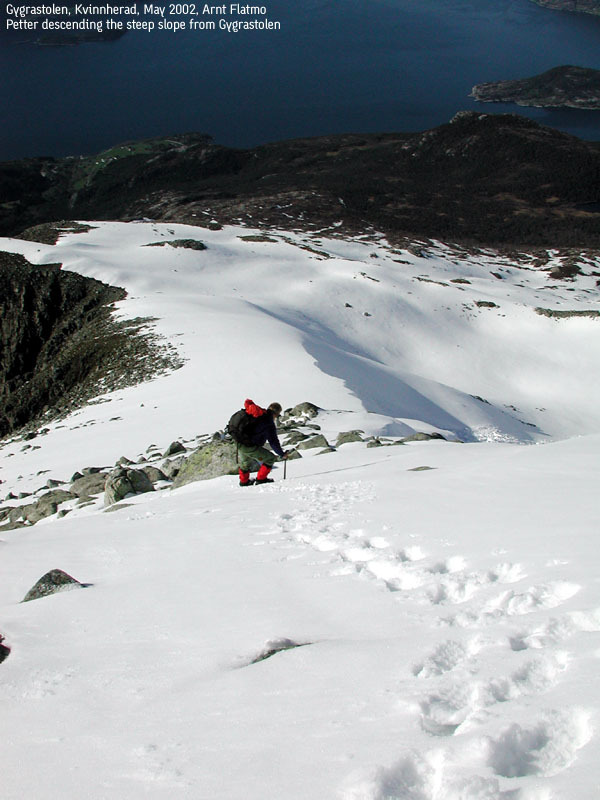 This scenery, with spring arriving in the lower regions, the mighty blue Hardanger fjord and winter still holding its grip on the higher peaks is something a climber must experience, words cannot easily capture it all. 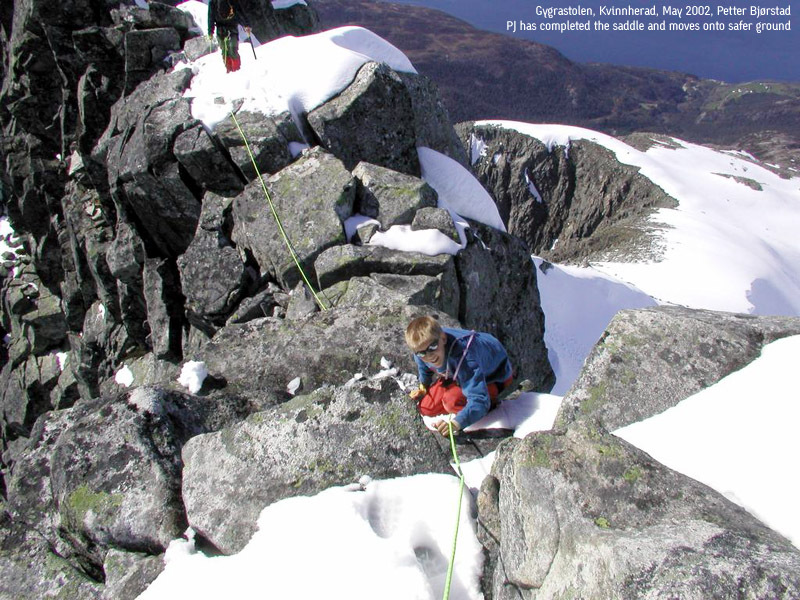 We decided to use a rope on the final summit ridge, the vertical drop on the ridge was higher than the reach of Pål Jørgen, he used the crack for climbing both ways. With warm, sunny weather it was just a pleasure to spend some time along the final section. We reached the summit around 1600, spent considerable time on photography and the view before returning the same route. We had planned to perhaps traverse and climb down along the north ridge, but the initial traverse of the saddle that separates the summit from this ridge would have required considerable time since steep snow dominated and few rocks that might serve as belay points could be seen. We were back at the church at 1845, a total of 7:30. The return across the ridge was again quite easy, but required some time since we continued to use a rope, similarly, the upper snow slopes are steep and requires care and attention when descending. Thereafter, the return hike was quite fast on good snow, then the red ring marked trail. Note that the elevation 1339 meter that can be found on many maps refers to a trigonometric reference point on the east side of the col connecting Gygrastolen to the east side. The elevation 1345 is listed on one of the maps from the Norwegian map service. One also can spot the 1340 meter contour on current maps. Gygre was the name of certain women in old Norse mythology that lived in Jotunheimen, the most famous mountain area in Norway. The story tells that such a Gygre once decided to block the southern side of the Hardanger fjord by pulling the large island Varaldsøy across. However, she lost her grip and fell backwards making the distinct basin below the Gygrastolen (the chair for the Gygre). Unsuccessful in her first attempt, she then jumped into the fjord in order to block it, but the fjord was too deep so again she failed and the fjord remains open. Gygrastolen as seen from the ferry. September 13, 2009. Start of the trail. Hike along this road until it ends, note the mailbox rack on the right. The summit can be seen high up to the left. The summit and the upper part of the south face. Arnt on the narrow section. This is technically easy, but a very narrow ridge indeed. The vertical drop on both sides is formidable. The final climb before the summit. On the ridge, Arnt enjoying the scenery. On the summit, the view is east towards Folgefonnen glacier. Pål Jørgen climbing the crux, there is very limited real estate to start from. 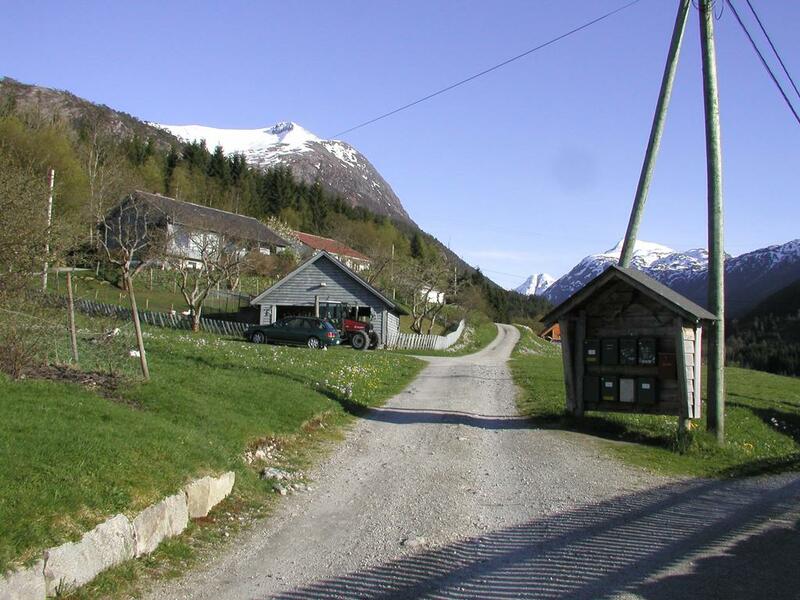 The local Rosendal Alps, the view is south. From Melderskin to Blåhatten (1.4 MB file). Pål Jørgen down the upper slope. Down climbing the snow slope.